I, Martina, and my 9 sisters grew up on a farm. I am a training officer and I take care of learners in a nursing home in Erstfeld. My husband is a representative for Culture and Youth in the canton of Uri. Marianne became a doctor in Lucerne, Roman is studying at the University of Bern, and Vera is in secondary school. It is our pleasure to tell you about the history of this valley and the people of the original mountain villages. We are looking forward to receiving guests from around the world. Already 70 years ago, our holiday house existed as the post office. My husband has been a teacher in the village for 20 years. He purchased this charming house and remodelled it with a feel for style. We live in the same house. We live in a village where others come to have their holidays. We are close to the mountains and the lovely lake, which has many leisure possibilities. The special thing about the holiday house is its typical and central rural placement with a wood-burning stove/fireplace, as well as the wild garden with a large linden tree. We have very good relations with our lovely neighbours. You will love it! You can rent winter sports gear in Bürglen, 15 km away, or in the Andermatt and Klewenalp ski areas. In the immediate surrounding (2 minutes walking), you will find a residential dining restaurant with regional specialities, a hotel with a cosy garden restaurant, a convenience store with fresh goods and pastries (fresh 'Gipfeli'), a catholic church, a bank, a post office, and the bus station. In just 20 minutes by car, you will reach the modern water park of Altdorf, a golf course, the Seedorf natural delta, the Minerals Museum and A Pro Seedorf castle, as well as the cantonal theatre, the arthouse in Uri, the historical museum in Altdorf (11 km away), and the Wilhelm Tell Museum in Bürglen. A washing machine is available for €1 per washing. My 3 children and I had a wonderful time staying in this apartment. Plenty of space, toys, books, games, and amenities. The drive up and down the mountain was a little scary the first few times, but we adjusted. The view and quietness of the village was worth the adjustment. The apartment was very clean and the hosts were extremely helpful and friendly. It reminded me of coming home to Grandma's - so comfy and cozy! Thank you! This is a traditional rustic apartment that serves families (especially with smaller kids) well. Most likely you'll spend most of the time outside of the house anyway, but even on a rainy day the apartment can hold you over. The owners are super friendly and very helpful. The drive up might be a bit challenging but rest assured that most drivers around you know what they're doing. Across the house there is a school playground which our kids liked a lot. 1/4 mile down hill there is another playground with fireplace that is great for a dinner or two. For families with kids between 5 and 12 one of the most perfect hikes is at Gitschenen. Drive up to St.Jakob (ample parking space) and take the Gondola up. At the top there is an easy (veru little elevation change) hike through the various types of surroundings Switzerland has to offer (Forrest, little spring, open mountain path). At the half way point there us a little fireplace so don't forget to pack some Bratwurst and Cervolas (hotdogs). A cruise from Flüelen (about 25min from the apartment) is an awesome activity for both sunny and rainy days. You can go all the way to Luzern (3hr) and take the train back. If the kids want to go swimming there are a bunch of options on the lake (Iselten, right where you ascent to Isenthal; Seedorf (a larger, more organized spot) or indoors at the Wellwnbad in Altdorf (great for a rainy day). Herzlichen Dank für das Feedback. Isenthal ist für viele ein noch unbekannter Geheimtyp mit vielen Erlebnismöglichkeiten - gerade auch für Kinder oder Senioren. Doch bedeutend günstiger als Tourismusorte andernorts. We didn't meet Martina, but Joseph and their daughter welcomed us. They were really friendly, and were available for any questions, as they stay in the upper floor. The house was really comfortable for six of us,and the baby in our group had some nice toys tò play with. The surroundings are really nice, with some awesome views of the mountains. There is a grocery shop, 2 restaurants a few steps from the house and a bus service that almost comes to the door. :)....There is also safe parking available nearby the house. Only difficulty is to go anywhere, you will have to drive down the mountain , and the road is not very wide. But there was not much traffic through the road, while i stayed. Will surely recommend if you are looking for a relaxing holiday in the mountains. We stayed for one week, March 2017. It was warm, sunny days. The apartment was comfortable, well equipped. We had coffee in the yard, enjoying the sun. A lot of toys/games for kids. Also travel/tourist information were available in the apartment. Bedroom had good comfy large bed and large closet. Bunk bed was good for children. Two other rooms looking at the street and school across it. The kitchen is well equipped with eating in table. The cloth washing machine on ground floor comes handy. Isenthal is small village, about 40 minutes from Lucerne, with 4km drive up the mountain with great views. We wanted to explore small Swiss village, and this was perfect. Across from apartment there is guest house that has good food breakfast, dinner, also nearby hotel, which we did not eat there. As others mentioned a mountain lift is nearby, and village has small store. We did enjoy every minute. Our trip was amazing. The Holiday House was very clean, comfortable and centrally located. We only wish that we could of stayed longer. The people in Isenthal are very friendly and eager to please. Planning on coming back and renting the same place next year. Isenthal is a tranquil village in the middle of central Switzerland, not far from Lucerne, Zürich, the Gotthard, and holiday destination, Andermatt. The village is located in the middle of a lovely mountainous landscape and hiking area, in the unique 'Uri-Gotthard-Andermat' nature arena. A mountain road leads directly to the famous Lake Lucerne beaches and to the national Weg der Schweiz hiking trail. Also in the area is Rütli, the birthplace of Switzerland with Wilhelm Tell. Very closeby as well is the historical Gotthard road with the Via Gottardo. Isenthal sits far away from the tourist bustle. The village is a starting point for hiking, and mountain and ski tours in the middle of nature. In the valley, you can visit the family-friendly Gitschen ski area and one of the purest swimming lakes for sailing, surfing, and swimming. 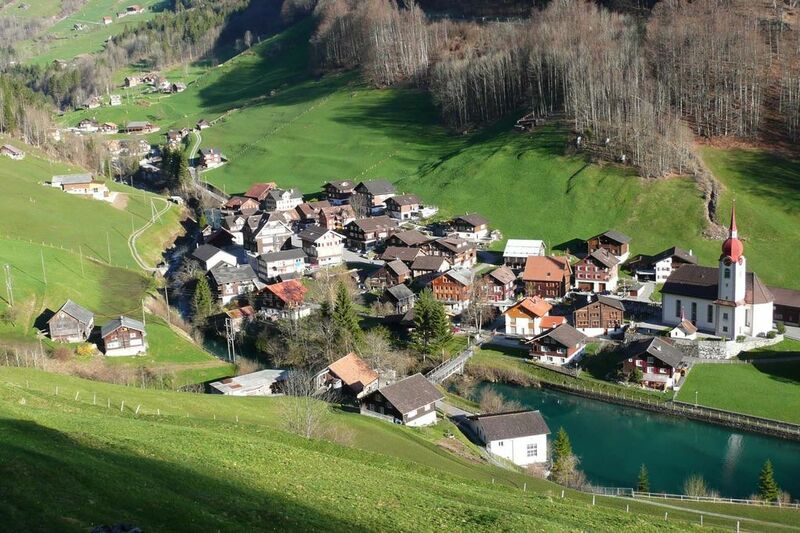 Isenthal is located in the heart of Switzerland. Within 20 minutes, you can reach the main town, Altdorf (with the Tell memorial and a Tell museum). The city of Lucerne is one hour away. You can visit Zurich or the southern, sunny Lugano, which is located in the Tessin canton. Seedorf golf course, climbing facilities, surfing and bathing beach, Isleten, the water park in Altdorf, and ski, hiking, and mountain tours. Not far from this holiday home in Isenthal - from Lake Lucerne following the motorway towards Gotthard - in Andermatt, one of the most modern holiday destinations is being built along with a winter sports arena and an exclusive 18-hole golf course. The Egyptian, Samis Sawiris, is constructing this great holiday resort. In Isenthal, Gitschen ski area offers a family-friendly and very affordable skiing area with a ski lift and a children's lift (please, visit their website). There are ski courses, an inexpensive ski kiosk and a very cosy mountain inn (please, visit their website). Those longing for a larger zone, can visit the large skiing areas of Andermatt (see the official Andermatt website) or Klewenalp (see the official Klewenalp website). On top of that, there are skiing areas in Bielbiel-Kinzigag and Eggbergen (please, see their official websites).